If you’ve done any work in social media, then you know that what’s cool right now, may not be next week, and the best way to capitalize on a trend is by getting in front of it. The algorithms are always being tweaked. To help give you a leg up, I’ve compiled some new social media features for this week. If you find this blog and it’s more than a month old, be forewarned, the information below might not be relevant. That being said, I’ll have one of these every Monday, and you’ll find it under the social media section on our blog page. With all of that out of the way, let’s just jump in! Instagram has been able to virtually dress you in shades or a top hat since launching face filters earlier this year but now those same effects are accessible while live-streaming. On Thursday, September 21, Instagram announced an update that brings live face filters to the app, kitten face and all. The update brings the augmented reality feature to live-streaming, instantly swapping out the different filters and face effects. 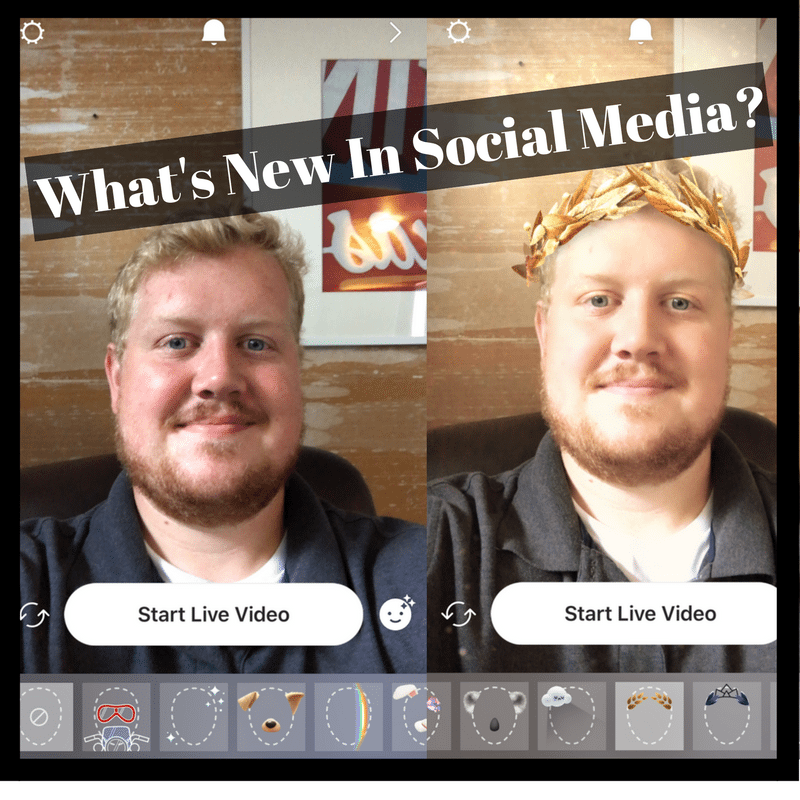 Users can access the usual slew of face filters that are available for stills and pre-recorded video, but Instagram is also bringing a sunglasses filter exclusively to the live option. Tapping on those sunglasses will get different landscapes reflected in the lenses. The sunglasses face filter will be exclusive to live-streaming for the first week, Instagram said. The company says that users can try on as many face filters as they like during the live broadcast. The feature to save a live-stream to Stories or discard at the end isn’t changing with the new filter compatibility. Live face filters have begun rolling out, but Instagram says the global rollout will take a few weeks, so some users may have to wait before seeing the feature. You Following ME?! ARE YOU FOLLOWING ME?! In a new update to Android, Instagram now shows you if a follow is mutual by highlighting the information at the top of their profile. The quiet Instagram followers update hasn’t yet made its way over to iOS, but shouldn’t be too far off. With the change, at the top of the user’s profile, a new “Follows you” will appear underneath the username and bio, if that user is among your followers. The new feature appears above where Instagram shows your mutual followers and displays which of your followers also follow that user. If you’re a business/band/use your insta for your side hustle, this could prove to be an invaluable tool. This should make it easier than ever to find who to unfollow, so you can re-follow later down the line. A lot of times, when a business follows me, their profile might get lost in the notifications, but if it pops up again, I usually investigate and give it a follow if it’s something I’m interested in. Twitter Twends: new “Popular Articles” offers a comment free look at your favorite articles! Finding the most popular articles just got a bit simpler. Twitter recently confirmed the global rollout of a new feature called Popular Articles, which creates a list of the most talked-about links on the 140-character social media platform. Curating top news stories isn’t a new feature to social media. Facebook has been playing with this feature for some time now, but Twitter is now getting in on the game, sans egg avatar keyboard trolls. Pinterest is a home for my mother to organize all of her Etsy finds(Obviously it’s for more than that) — but the platform could soon be getting even more organized for those Pins. During the TechCrunch Disrupt conference in San Francisco, Pinterest CEO and Co-Founder Ben Silbermann said that a new feature called “Sections” is currently in beta testing, with a public rollout expected within the next few weeks. The company first mentioned Pinterest Sections in a blog post announcing the milestone of 200 million users, but didn’t give the feature a name or a timeline. Now, according to the presentation, the feature has a name and is expected to launch in a few weeks. Sections are Pinterest sub-boards, designed to organize my mother’s larger boards to help make individual pins about decoupage easier for her to find. Thanks for reading! If you’ve got any questions or have a new social media feature or trend, send them my way, louie@bmusedimaging.com!